Don't worry, white_lotus. The Violet you want - the one I desperately want too - is long ago sold out. Money would not make a difference. Thanks that makes me feel better saskia_madding. Now I'll just make some pancakes with blueberries and chocolate chips and I'll feel fine. Deep Dark Violet should still be available. I just got a bottle in June. In fact, when I ordered from Atsu Rakuten was showing most of the Deep colors as being in stock. Really? When I asked a while ago, they were out of stock and not planning on getting any in. I was going by Atsu too. - and Nodaiko Violet isn't in stock. How do you like the Nodaiko Violet? Have you tried the Moss Green? 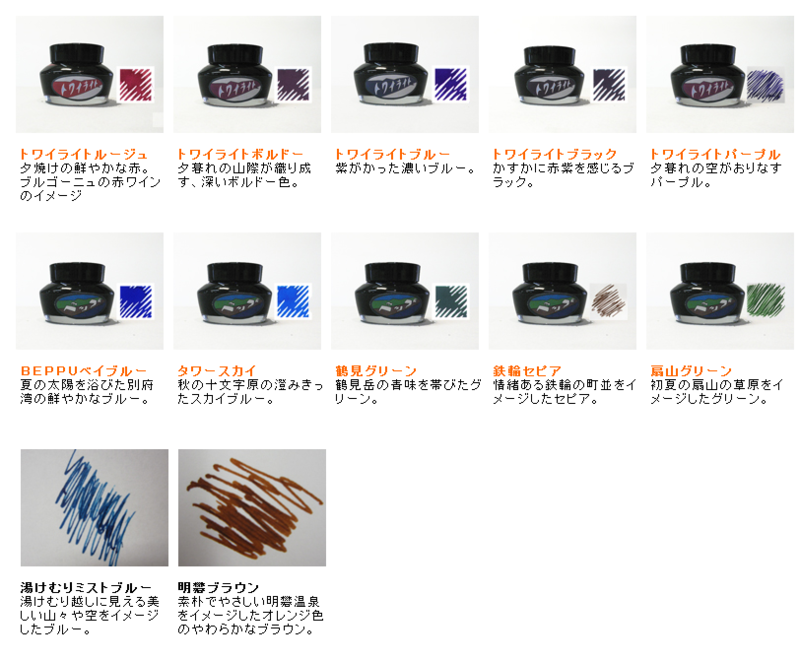 There seems to be a new for 2012 Deep Purple Black ink, but that isn't the same as the Nodaiko Violet. It seemed like the other deep colors were still in stock. 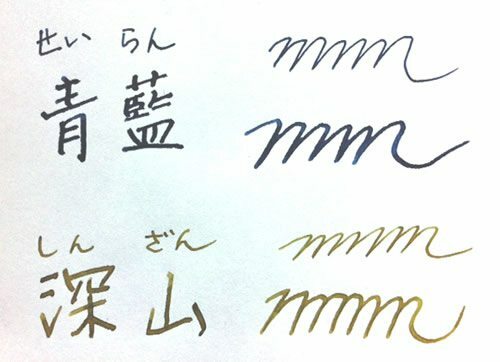 I recently got an ink from Atsu that I believe he said was a Hougado ink, though now that I look at it, it doesn't say Hougado (or Pen Gallery) anywhere on it that I can read. (I can read the Japanese kana, but not the kanji.) 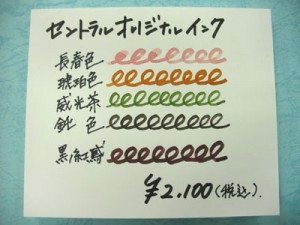 Anyway, what it does say is Gunma Great Mountain Myougi - Original blend ink. And under that, Myougi Umber. But the katakana is for "amber," and the color is amber, so I am assuming that's a translation mixup. Edited by swanjun, 25 August 2014 - 00:07. Okay, it's time for me to weigh in on this thread. #1. I've kind of decided to make it my mission to get all these random Sailor inks and test them out, and compare them to each other. Of course, that takes a long time, but I am still trying! 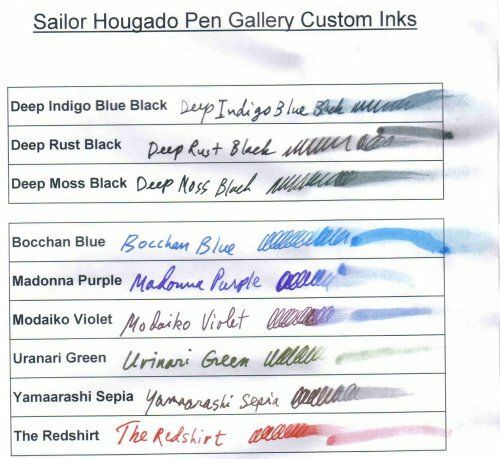 If anyone finds new Sailor inks, please let me know so I can take one for the team and snag them. #2. The SOL greens (two of them) and the Turner, Pushkin, and Vermeer (a blue ink), were LE inks from the Kobe line. I got them from cool-japan on ebay, but it looks like they aren't available anymore. Also, the SOL light green is AWFUL, in my opinion - check the review section, I'm pretty sure I posted something. #3. I've got all the Onago-iro ones, and the Pen + Message ones are all on their way, soon to be here (probably Wednesday). Damn, more Sailor inks! LOL! Hey buddycakes, send me a PM when you find best way to get these other new ones. Don't have any Sankodo or Onnago-Iro day. Don't forget one of their best ever inks was Red-Brown. Still have two bottles of it before they discontinued it years ago. Edited by SamCapote, 25 August 2014 - 07:34. There are two new Kobes! Don't worry Algester, the #50 blues are sold already and 2 of the 3 greens are already gone too… Hopefully they'll be able to get more. Edited by Algester, 26 August 2014 - 14:49. 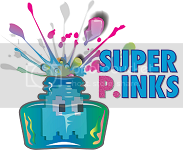 Has anyone bought ink directly from Rakuten before? I'm considering giving them a try, but I know WRE can generously fudge shipping costs so I don't pay customs. I never asked them, they just did it. What are Rakuten's customs forms like? Are they faithfully honest? Because if so, it's worth pay the s/h with WRE. thanks so much for your hard work Algester! Keep it up when you have the stomach for it. every two weeks I'll buy more ink and put up more swabs. My pen + message inks came today, so hopefully I'll have swabs up by Friday. I have purchased From Rakuten directly from the Global site in English twice in the past for pens. It's kinda like amazon and if you ask politely to the store front they will send you a PP request and sell you items even if they don't have a international shipping option. The only thing is that it'll be all in Japanese (google Translate will help here) from the order statement to the shipping form. I decided to order directly because I didn't want to bother with proxy fees or services for small items which add up over time. They have major pen stores listed there too so it's not like random people opening their side stores out of boredom or eBay. Saskia, where can we see your swabs? I know there are reviews here at FPN. Edited by Algester, 27 August 2014 - 15:25.